Home gardens are a great way to produce healthy, nutritious fruits and vegetables. But healthy eating doesn't have to stop when gardens quit producing. 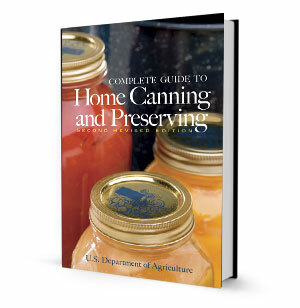 With the Complete Guide to Home Canning, you can preserve the healthy, home-grown nutrition you value and make it available all year round. Includes scores of simply written recipes that enable even beginners to prepare such taste-tempting dishes as smoked fish, turkey-tamale pie, chicken croquettes, Mexican tomato sauce, strawberry-rhubarb pie, chile con carne, apple butter, pickled sweet green tomatoes, and a peach-pineapple spread. Every step, every detail is carefully explained and has been thoroughly tested by government experts. Detailed table of contents at the beginning of each section. Includes conversion tables for foreign equivalents. How to select, prepare, and can fruits, vegetables, poultry, red meats, and seafood. How to preserve fruit spreads, fermented foods, and pickled vegetables.